Earlier this fall, I was contacted by David from SportsCompression.com (HERE) to conduct my review of CEP Compression Socks (HERE). I was sent a pair of pink CEP Compression Socks in a women's size III. I told David that these would be great to try out after running marathon #3. I thought they would be great for recovery after the race. I also mentioned that they may be a good option to wear during the race if it were chilly, though I was doubtful I could wear compression socks for 26+ miles. He assured me that they would be a "good wear" during my 26.2 mile journey. These stayed in place during the entire 26 miles. I loved the fit. They never moved. Really. They felt really tight when I first put them ... but that was good. They were a perfect and clung to fit ME perfectly. I was a little concerned because I have bigger legs (stronger legs, right?!) for a runner, and was concerned that the top of the socks may dig into my legs and the back of my knees while I was running. But, they didn't. They were comfortable. They were awesome. Because the CEP Compression Socks kept my legs so fresh during the race, I was only feeling sore for a couple of days post race and went out for a recovery run three days post-marathon. I think that says a lot. I could have gone sooner, but mentally, I needed a break. Another great fact ... 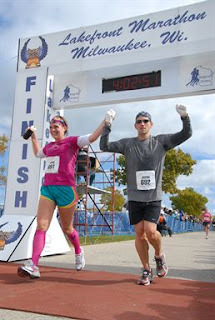 I kept all of my toenails after this marathon! With the other two I have had tons of TERRIBLE blisters on my feet, including under a few toenails. I've always lost toenails from a marathon. Not this time. Not a single blister! Believe it. If you're worried about chaffing and blistering ... dont't. At $54.99 they are not a small investment for your running wardrobe. We all know that. But, I think they are a great investment at that. Men and women are both wearing them at races. Men seem to wear them for function and women wear them for fashion and function (at list I do!). 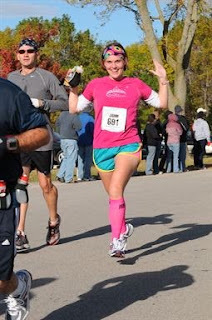 My legs and I had a great experience at my marathon with CEP Compression Socks. I think you'll have a great experience as well. Maybe you can put a pair on your wish list for the holidays?! Have someone else make that investment for you! CEP Compression socks are for runners and endurance athletes. The scientifically optimized pressure flow provides your muscles with the maximum amount of oxygen and energy during performance and recovery. The times are over where the sole purpose of socks and stockings was to protect feet from blistering. The CEP compression sportsocks are the first functional sport socks with a unique compression profile that provides a scientifically proven increase in blood circulation and a consequent increase in performance. Achilles Tendon Support: Additional support of the Achilles tendon protects and prevents irritable tendons. Padded Foot Soles: The special support of the foot sole prevents irritations caused by pressure spots. Ventilation Channels: For a pleasant foot climate. 3-D Fit: The socks adjust to the anatomy of the leg and foot for a perfect fit thanks to the three-dimensional manufacturing process. Colors available: White, Black, Pink (women’s only), NEW Progressive Design: White and Black, NEW Green Socks! Our company was formed in 2008 with the passion to bring quality products to athletes just like us. Through our quest in testing products for our own personal use we decided to sell only the top items we have experienced and focus solely on compression sportswear given the increased category importance. Every athlete can benefit from compression and we want to give athletes an experience where they trust the products offered and feel safe knowing the company behind them supports the customers needs. It's our goal to be a favorite on the internet for niche products that can make a positive impact in an athletes performance. if you aren't lucky enough to win a pair of your own! Already a follower of your blog. Already follow you on FB. I like Running Diva Mom on FB. I like Sport Compression on FB. I like sportcompressionsocks.com on FB. Already follow you on FB, that's how I found out about this wonderful giveaway. I would love to try out the women's all sport calf sleeves, in black. I just became a fan of SC on FB and let them know you sent me by writing on their wall. I would love the women's pink compression socks! I'm also following you on FB. 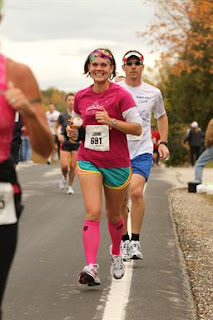 I of course love the run & recover socks in Womens Pink! I would love to have a run with NO shin splints at all, if this does the trick, it just *may* be what I need! I "liked" CEP on FB! Adding your giveaway to my sidebar! Hey, Diva! I follow your blog! Aaaand.... I went to the sportscompression website, and I'm a girl who loves the pink socks! became a fan of them on FB and left a comment! I'm a lady who wants the pink! I like SC on FB and left a comment! NofSahm linked you up on Facebook! I "like" sports compression on Facebook! I am a follower...slow these days (heehee sore legs from racing) but a follower. Linking you on FB...I reeeeeeeeeally need to win some compression. After 180 days my legs are in need! Although I would love to try the pink running socks, I noticed they carry ski/snowboard compression socks and I am gearing up to hit the slopes! I want to give those puppies a try! I liked Running Diva Mom on FB! I have a pair of CEP sleeves in black. I'd love a pair of socks in black too! Linking you on my blog right now! I think I would have a hard time choosing between the pink and lime socks. Probably lime though. Female. I'm a fan of CEP on facebook and I left you some props. Linking you on my sidebar right now. Thanks for the great giveaway! My favorite socks are the pink Run & Recovers! And I follow Running Diva Mom on Facebok. I'm a woman. I like the pink Run & Recovers! I like Sports Compression on Facebook and left them a message. I already like sports compression on fb. I'm a woman, and I'm grooving on the lime green. I would love a green pair, but I think I would let Jesse get a black pair! and on FB as well. I'd choose the women's black. I like Running Diva on facebook! womens socks in either pink or white....tough call! I love the women's in pink. I'm a fan of sportscompression on FB! 2 - I follow you on fb! I am a fan on FB too. Of course I want Pink.... and I am a "girl"
I became a fan of Sports Compression on FB! I'd go for a GREEN pair! I follow Running Diva Mom on facebook! I would get a pair in black or white! I'm a woman and I want some white socks...just plain ones. I bought some pink ones and need some just white, LOL. I would rock the pink as well. Thanks for showing me their website- I actually wear stockings everyday.